The Runner can spend clickclick to break up to 2 subroutines on Viktor 2.0. Hosted power counter: Do 1 brain damage. 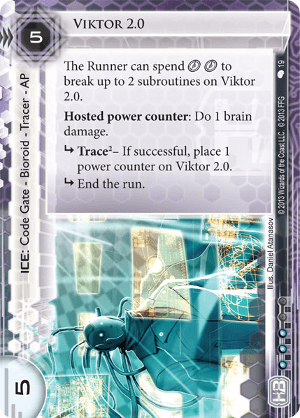 subroutine Trace – If successful, place 1 power counter on Viktor 2.0. Marcus Batty &/or Tyr's Hand: Sticking a surprised runner with either of the s on Viktor 2.0 could potentially be a game ending event, or at very least put some momentum into the corps favor. Surprising the runner with insufficient s may result the runner losing some IQ due to brain damage possibly swinging momentum into the corps favor. Power token can be saved and used at just the right moment, giving corp lots of flexibility and possibly cause the runner to question himself at every turn. With it's higher cost, such cards become juicy targets for operations such as: Emergency Shutdown or Forged Activation Orders etc. Even though it is taxing, runner has lots of options to navigate through this card. Do 1 brain damage is dependent on successful trace taking away some control from the corp. Brain Damage decks are always looking for ways to cause brain damage, Viktor 2.0 provides such opportunities. Glacial decks should give Viktor 2.0 a look because of it's tax value to the runner at reasonable cost.